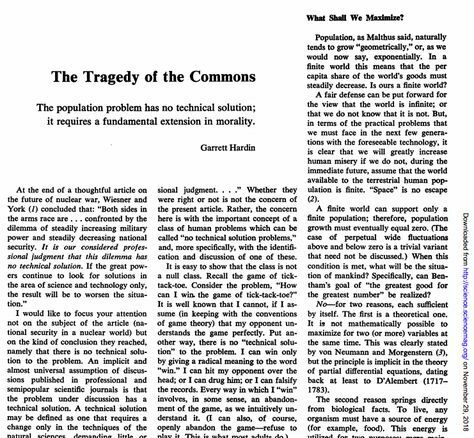 In a brilliant Twitter thread, UCSB political scientist Matto Mildenberger recounts the sordid history of Garrett Hardin’s classic, widely cited 1968 article “The Tragedy of the Commons,” whose ideas are taught to millions of undergrads, and whose precepts are used to justify the privatization of public goods as the only efficient way to manage them. Hardin’s paper starts with a history of the English Commons — publicly held lands that were collectively owned and managed — and the claim that commons routinely fell prey to the selfish human impulse to overgraze your livestock on public land (and that even non-selfish people would overgraze their animals because they knew that their more-selfish neighbors would do so even if they didn’t). But this isn’t what actually happened to the Commons: they were stable and well-managed until other factors (e.g. rich people trying to acquire even more land) destabilized them. Hardin wasn’t just inventing false histories out of a vacuum. He was, personally, a nasty piece of work: a white supremacist and eugenicist, and the Tragedy of the Commons paper is shot through with this vile ideology, arguing that poor people should not be given charity lest they breed beyond their means (Hardin also campaigned against food aid). Hardin was a director of the Federation for American Immigration Reform and the white nationalist Social Contract Press, and co-founded anti-immigrant groups like Californians for Population Stabilization and The Environmental Fund. Mildenberger argues that Hardin was a trumpist before Trump: He served on the board of the Federation for American Immigration Reform (FAIR), whose talking points often emerge from Trump’s mouth. As Mildenberger points out, this isn’t a case where a terrible person had some great ideas that outlived them: Hardin’s Tragedy of the Commons was a piece of intellectual fraud committed in service to his racist, eugenicist ideology. What’s worse: the environmental movement elevates Hardin to sainthood, whitewashing his racism and celebrating “The Tragedy of the Commons” as a seminal work of environmental literature. But Hardin is no friend of the environment: his noxious cocktail of racism and false history are used to move public lands into private ownership or stewardship, (literally) paving the way for devastating exploitation of those lands. By contrast, consider Nobelist Elinor Ostrom’s Governing the Commons, whose groundbreaking insights on the management of common resources are a prescription for a better, more prosperous, more egalitarian future. Update: If this kind of thing interests you, check out Tim Harford’s (previously) 2013 column on Hardin and Ostrom’s brilliant response to him.